To open, let’s distinguish between economic activity for expansion, economic activity for maintenance and economic activity for sustainability. Expansion is how the standard of living in a country is increased. In short, when economic activity exceeds what is required to maintain a baseline level for a population of a given size, the result is greater affluence per capita in the population. Think of affluence as that portion of income that can be devoted to discretionary spending beyond meeting truly basic needs. On the other hand, maintenance merely keeps up with population growth, or lack thereof, and maintains the status quo. Depending on where you live this could be well beyond or below basic needs. Sustainable economic growth would be economic activity that for a given population size and life style could be continued indefinitely. An economic model that could continue indefinitely would require a lifestyle that rests upon a sustainable draw on resources and waste generation that can be absorbed and processed by the planet. Presently, a minority of the world population enjoys an affluent lifestyle that was generated by the expansion model and depends upon an unsustainable draw on resources and waste generation. Many such developed economies are having difficulty, for various reasons, with expansion and may be reluctantly trying to hold to a maintenance model by default. There are a number of impediments to economic activity based on expansion. These impediments open up an opportunity to consider the possibility of developing an alternative model, which should focus on sustainable economic activity. It may be possible for sustainable activity to also maintain some level of affluence, given a small enough population, or significant improvements in technology and its application. Several factors currently depress expansion of economic activity, especially in the developed economies, which are responsible for a major portion of the world economy. In no particular order of importance, the first of these is debt. Almost all of the developed world’s economies are heavily in debt, both public and private. Heavy debt is also widespread in the developing world. In January, 2017, Reuters News reported that total global debt had reached 325% of global gross domestic product (GDP) and rose by 11 trillion dollars in the first nine months of 2016 alone. The report also indicated that approximately half was public (government) and half private debt. Few embrace the implications of this situation, but it seems obvious to me that a sound economy cannot be built upon a foundation of burgeoning growth in public and private debt. Generally, debt is most defensible when it is put to productive purposes. The underlying premise of capitalism is that capital is accumulated through saving surpluses and then lent to productive enterprises that will yield sufficient return to, at minimum, repay the debt plus a reasonable return on the loan. The developed economies have drifted so far from this view of debt that to call them capitalist economies is laughable. The second factor is birth rates (see Figure below). Again, virtually all developed countries are at or below the replacement rate for their population, which is on average 2.1 children per adult female of reproductive age. This has two obvious consequences. The first consequence is that the size of the population in developing countries is either no longer expanding, is static or is declining. For example, according to data reported in Wikipedia, as of 2005, the fertility rate in Europe was down to 1.41, in North America down to 1.99, in Japan down to 1.5 and in China down to 1.6. When population is expanding in developed countries, it is almost always due to immigration. The mere shifting people around doesn’t, in itself, affect total world population to any significant degree. It does, however, increase the demand for resources as immigrants move to developed countries with the expectation of being able to improve their lifestyle, a goal that they often achieve. This could have an effect on total population because there is a close relationship between improvement in lifestyle and lower birth rates. Lifestyle, of course, includes more income but also includes other factors such as better health care and greater personal sovereignty, especially for women. The decline in fertility rates is a global phenomenon illustrated by a worldwide fertility rate of 5.02 in 1950 and a rate of of 2.65 in 2005. It is estimated that the worldwide rate will be down to 2.05 by 2050. This rate is slightly below the projected replacement rate of 2.1. Even so, large portions of Africa and the Middle East are projected to remain above their replacement rates. The second consequence of the decline in birth rates is to increase the proportion of older people in the population. An examination of spending by age cohort indicates that spending begins to pick up for people in their 30s as a result of career progression and family formation. Peak spending occurs in people in their 40s and 50s. People moving into their 60s and beyond, as a group, make fewer purchases in the consumer economy than do younger people. Thus, as a population ages and becomes progressively older, on average, there is a reduction in demand for consumer goods. As the demand for consumer goods falls, this further suppresses the potential for expansion of the economy. A third factor is the proportion of the working-age population that is employed. It is obviously difficult to be a consumer of any consequence if one has little if any discretionary income or perhaps no income at all. Governments are prone to manipulate economic statistics such as unemployment rates so this problem is a bit difficult to appraise. However, an independent estimate from Shadowstats for the U.S. put the true unemployment rate at approximately 23% in 2016. At the same time, U.S. government statistics suggest that unemployment in 2016 was 4.7%. This discrepancy is due in part to Shadowstats including discouraged and displaced workers in its estimate while the government only counts individuals actively seeking employment within the past four weeks. If you’re unemployed and haven’t sought employment in the past four weeks, you aren’t counted by the U.S. Bureau of Labor Statistics as unemployed. Whatever the true figure, it is clear that declines in economic activity will further increase unemployment. To add fuel to this already bleak outlook, a recent estimate put the loss of jobs to automation, worldwide, at over one million per year, with acceleration likely going forward. This will have its biggest impact on older workers who are less able to retool for alternative employment. This is due to time constraints relative to remaining working life, existing financial demands and lack of resources to pursue such training. Many of those unemployed now and not counted because they have given up seeking employment probably belong in this group. Even for those older workers fortunate enough to retrain for alternate employment, they will be facing new careers at the entry level that seldom provides the income and benefits lost. This is not a solid basis for expanding economic activity. A fourth consideration is resource limits. The World Population History site defines ecological footprint as the rate of consumption of natural resources and the generation of waste, together with the planet’s ability to replenish those resources and absorb the waste. Carrying capacity is an estimate of how large a population can be supported by the available resources and their replenishment, along with the capacity to reabsorb waste. The Population Institute estimates that the human species’ ecological footprint is currently between 140% and 150% of carrying capacity. 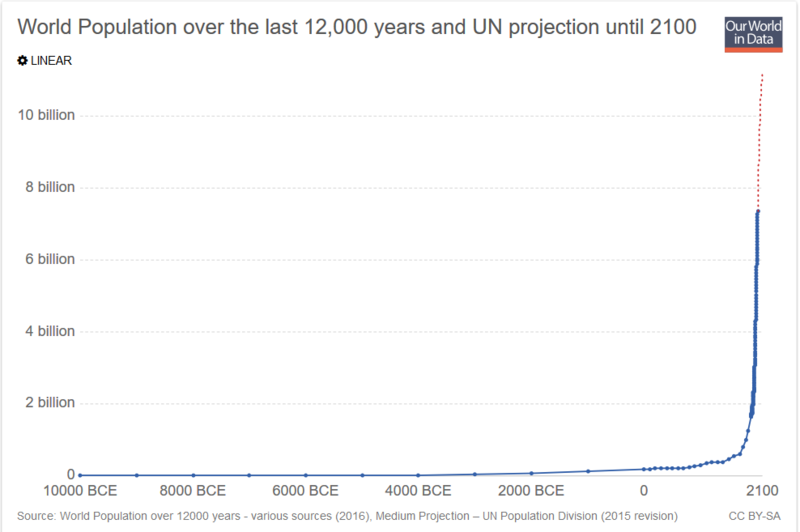 Further, they estimate that before the population expansion stops and begins to decline, the total population will between 9.5 and 11 billion people (see Figure below) and will be at approximately 300% of carrying capacity. In short, to maintain the status quo now requires the resources and capacities of 1.5 planets and will soon require the resources and capacities of 3 planets. Obviously, this is not sustainable. Perhaps the load can be reduced by greater efficiency and new technologies, but if not we may be in a race. A race to see which line we cross first — an ecological or a population implosion. If the latter comes first then the former might be avoidable. If the former comes first the latter may be far greater than expected from a decline in fertility rates. Fred Pearce, in his book The Coming Population Crash, offers a couple of interesting statistics. First, the figures he presents indicate that the ecological footprint of the average U.S. citizen is just shy of ten times that of the average Indian or African. He further compared the world’s wealthiest one billion people with the remaining people and found that the ecological footprint of the wealthiest is 32 times that of the remaining population. If you, as an individual, have an income of at least $12,500 (just above the U.S poverty criterion for an individual), you can count yourself among the top one billion. He offers the following illustration. In short, the suggestion was that a decrease in the number of affluent persons would do more to reduce the ecological footprint of the human species than to merely decrease the size of the overall population. Perhaps this will be accomplished independently of any policy initiatives or programs. A demographer recently pointed out that demographic trends, especially in the developed countries, foretell an impending world population implosion. He thinks this could begin as early as 2050 while others think 2100 is a more likely date for population declines to begin. Fortuitously, the leading edge of the predicted decline will be in the developed countries with the most affluent populations. Longer term, the trends will impact the overall world population. The critical question is whether or not this population decline and lessening of the demands on the environment will be large enough and occur soon enough to save the planet from ecological disaster. Given all the factors potentially contracting economic activity, especially in the developed countries, one must consider whether the goal of expansive economic growth is truly a viable concept except perhaps temporarily for the most impoverished countries. Over the last decade there have been massive attempts by governments in developed countries to stimulate economic growth through lowering interest rates and by infusing money into their economies, which has been “borrowed” through various mechanism and thereby further increasing levels of government or public debt. The premise that lies behind these moves is that lower interest rates and more money available for lending will result in more borrowing and spending for consumption. The hypothesis is that this increase in spending using borrowed money will in turn stimulate economic activity. The simple fact is that private debt is already excessive. If this strategy yields any positive effect on discretionary spending, it is likely to be limited and of short duration. One technique that is invariably turned to under such circumstances is to lower credit standards to stimulate borrowing. This often has the desired effect short-term but makes likely further undermining of the economy through subsequent credit defaults. It would appear that it is past time for the developed countries to wake up to the fact that expanding growth economies based on consumption simply can’t be sustained. Where resources should be focused is not on how to bring back expansive growth but rather on developing a new economic philosophy that is not consumption and growth-oriented. What is needed is an economic philosophy that is oriented toward a sustainable standard of living. Such a philosophy would, on average, result in a lower standard of living in developed countries and a higher standard of living in developing countries. This clearly will not come about under an economic model that emphasizes consumption and expansive growth. Whatever form such an economic philosophy might take, it will likely meet with massive resistance on many fronts. There are billions of people who aspire to an affluent life- style, many of whom will not be happy to hear that it is not possible. There are many hundreds of millions of people who enjoy affluent lifestyles who will not be happy to hear that it cannot be equitably justified nor environmentally sustained. In addition, there are huge vested interests in the business community, government and social institutions that will fight change to the bitter end. At present, economic thinking holds that the goal should be to raise the standard of living in economically depressed countries to one approximating that in the developed countries. However, it seems highly unlikely that the resources exist to make this a viable goal. Even should it be accomplished, the demand on resources would, in all likelihood, result in an environmental collapse. Even if the environment proves more robust than believed, the current and anticipated future consumption of resources isn’t likely to be sustainable. Presently, it is estimated that between 800 million and one billion people live lives in which hunger is a regular experience. In a recent article (March, 2017) in the New Scientist magazine, it was suggested that enough food is being produced now to meet the needs of those people short of sufficient food. All of the food necessary to feed the hungry is lost through waste, according to the author of the piece. However, the problem isn’t simply to stop wasting food, because there are coincidental factors such as infrastructure, distribution and payment for the food even if made available. It is estimated that to meet the growing needs moving into the middle to the end of the century will require an increase of 70% over current agricultural production levels. One major problem area going forward is Africa. Africa presents a special problem for several reasons. The two most critical problems are robust population growth and failure of the green revolution, that has ended hunger in other parts of the world, to penetrate into Africa to any significant extent. However, it is time for green revolution 2.0. The first version of this revolution has relied upon intensive agriculture employing manufactured fertilizers, pesticides, new crop strains, massive amounts of water for irrigation and mechanization. All of the components comprising green revolution 1.0 pose problems that need to be addressed in version 2.0. According to the New Scientist piece mentioned above, one solution is to develop an intensive and precision-based approach to agriculture. This would include new types of food crops relying on things like algae and genetically modified crops that require less use of pesticides, fertilizers and water. Further, such crops should not require expansion of the amount of land under cultivation. Version 2.0 should also employ technology to provide precision amounts of pesticide, fertilizer and water only to the plants that need it and only in the amounts needed (see an example of precision agriculture). Finally, while 2.0 needs to be adopted throughout agriculture, it especially needs to be implemented in the areas where the need is greatest and by the people in need. To do this successfully will require overcoming political, cultural and attitudinal obstacles. Another area that will surely become more problematic as we move deeper into this century, with growing population pressures, is farming animals for meat. This practice is a highly inefficient method of producing food. Animal farming uses more energy and water than growing crops like wheat or potatoes. Further, it puts significant amounts of the greenhouse gas methane into the atmosphere. The US DOE estimates that there is three times as much man-made methane as man made CO2 being released into the atmosphere. Sooner or later, efforts to reduce greenhouse gases will have to come to bear on methane and that means on animal farming. The worst offender is beef. Of popular meats probably the best environmental choice is poultry. If you want to make a personal contribution to reducing greenhouse gases, perhaps the best contribution you can make is to become a vegan, at least until cultured meat becomes viable. We do not presently have a sustainable economy model, especially in the developed world. Keeping everything as it is now leads to projections of a doubling of the demands above equilibrium by the end of the century or earlier. 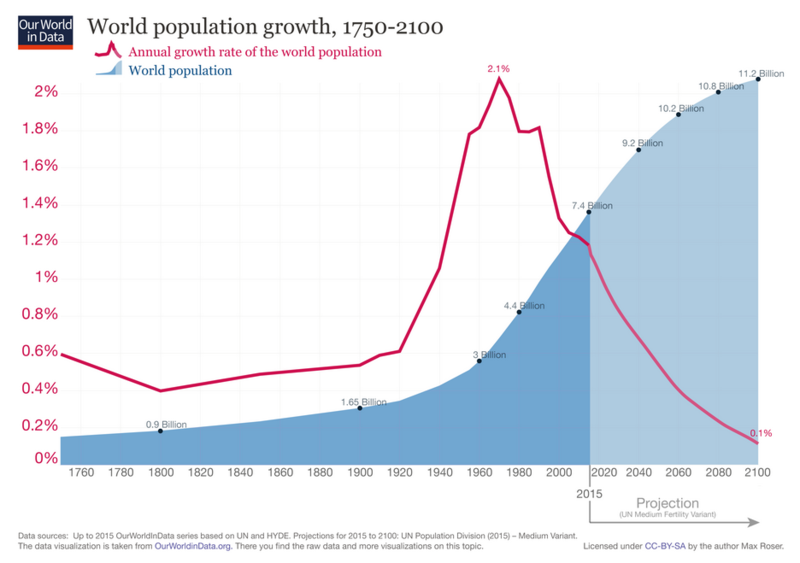 We may somehow manage to meet the needs of a world population that is expected to expand, at least until mid-century, if not to the end of the century. 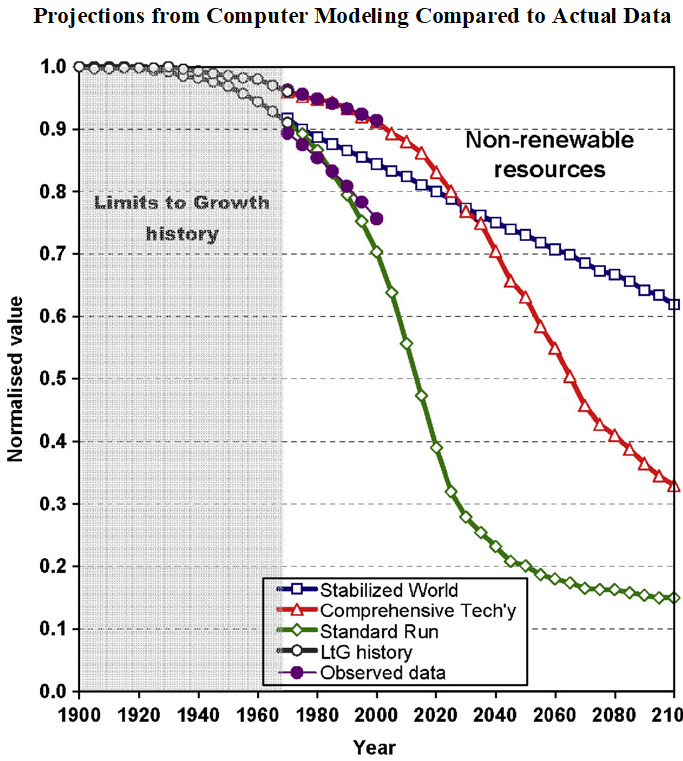 However, it is unlikely that we will reduce resource consumption to a sustainable level, even if we manage to cut in half resource consumption through greater efficiency while demand doubles or even triples. Likewise, it seems unlikely that we will be able reduce pollution of the environment to a sustainable level given the needs and demands of an expanding population. Perhaps, abundant additional resources can be obtained and processed off-planet. That would reduce pollution and lessen the strain on this planet’s resources and still permit a high standard of living for everyone. A scientist and science fiction writer, Ben Bova, wrote a book, The High Road, outlining such a plan several decades ago, but it did not garner much interest. Critics think this approach is not truly viable at present and they may be correct. However, plans exist to begin exploiting asteroids for resources. If not, then there is always the hope of salvation by new planet-based technology. Assuming that we manage to survive until world population goes into decline, the next big problem is to determine what would be the most realistic economic model that would permit sustainable economies. I am not an economist and won’t even hazard a guess as to what such a model might be (an alternative model). I’m just an observer commenting on things as I perceive them. However, I think the model would need to accomplish at least three things. First, it would need to adequately meet the material needs of everyone, which I would define in terms of providing a level of resources necessary for good health. Second, it would need to provide the opportunity for everyone to have a constructive role in society, which could include what has traditionally been viewed as work but would not be limited to such activities. Third, there would need to be enough opportunity for flexibility in lifestyle to provide for individual differences and freedom of choice without placing unsustainable demands on the environment. A model of this sort is probably not a realistic goal for a world population anywhere near its current size and expanding. Thus, the model would need to be implemented to coincide with the low point in the predicted population implosion. Some estimates put that low point at a worldwide population of approximately five billion, which would be about half the maximum of 10-11 billion projected for the end of the century. Some studies suggest that the upper limit on population, consistent with attaining sustainability, is about 7.5 billion. A goal would be to hold population, once down, to between 5 and 7 billion people. A population that stays within this range is probably the best hope for a sustainable economy and a healthy environment. The second big problem is to get a large enough buy-in to such a model that it can be successfully implemented. On this point, I will hazard a guess that, when proposed, it is highly unlikely to be freely embraced by a majority, especially in the developed countries. In my view, for such a model to be freely embraced would require a significant shift in attitudes. For this to happen, I think there would have to be a change in the prevalent philosophy underlying the thinking of a significant percentage of the world population. The current philosophical underpinning of thinking for many people is materialism. While this has been a productive way of looking at the world for science and technology, it has a significant downside. Implicit in scientific materialism is the view that the universe and life within it came about accidentally and has no inherent meaning or purpose. At the level of the average individual, this leads to the bumper sticker philosophy of “The one who dies with the most toys wins.” In short, the average person, especially in developed countries, derives meaning and purpose from consumption and accumulation. As long as this is how many people find meaning and purpose in their life, there is no hope for acceptance of a model for a sustainable economy and healthy environment that ultimately depends more on cooperation rather than on competition. If a sustainable model isn’t freely embraced, which doesn’t seem probable, then when circumstances reach a crisis level sufficient to make it clear to most people that there is no alternative, except the collapse of civilization and perhaps extinction, then an alternative model might be embraced. Such a crisis might be sufficient motivation, but species-suicide is not off the table. Leaving aside “crisis motivation” as the solution, what are the other options? I will answer this in terms of my own value system, which places a high value on individual sovereignty. One can use force, threat or intimidation, contrived incentives or persuasion to influence people’s behavior. Clearly, the first two options are coercive and inconsistent with the principle of individual sovereignty. Albeit more subtle, the third method is also coercive. The use of contrived incentives to influence a person’s choices is an effort to manipulate the person and therefore represents a soft form of coercion. The final method, persuasion, may be the only method that is consistent with individual sovereignty and is fully acceptable to me. However, this is an approach that takes long-term thinking and planning and cannot be implemented quickly. The mostly likely approach that I think governments will take, if they act at all, will be coercion by “police” action broadly applied and possibly leading to what might become a military dictatorship. Such an approach, I think, would require coordinated action by most of the world’s governments. It seems to me this would be very difficult to bring to fruition. There would probably also be massive resistance, overt and covert, to a broadly coercive approach. Whatever your position is on “climate change,” it serves as an illustration of how an activity requiring restraint that has to be implemented worldwide can generate resistance on many fronts. Widespread resistance would probably undermine the imposition of a sustainable model. Further, the stronger that governments become, the more susceptible they are to intellectual, economic and political corruption. Even if a strong arm approach should be initially successful, I think it would be eventually doomed to failure. Economist Steve Keen is optimistic about the final outcome, with a caveat, “Ultimately I believe we’ll work out a means to live sustainability on this planet and, in the very distant future, to live beyond it as well. But to do so, we have to understand our current situation properly. There is no chance to move towards a better future if we misunderstand the situation we are currently in.” See the Addendum at the end of the essay for a perspective on the current situation. I am not at all optimistic that a workable solution can be found and implemented in a successful manner quickly enough to save the planet and save Western-style civilization. I am reminded of a comment by Terrance McKenna, a commentator on culture, who described technological civilization as a cultural temper tantrum. This brings us to the most basic question of all and one that many might avoid — does it really matter whether we save the planet and ourselves or not? The quick and thoughtless answers is yes. However, consider two diametrically opposed ontologies. One has already been alluded to above — scientific materialism, which sees reality as having an independent existence, external to ourselves. The reigning paradigm posits that the material universe came into existence as a random event. As luck would have it, it just happened entirely by chance, to be organized in such a way that it would unfold with the necessary conditions present for life to evolve. Finally, again by chance, the random interaction of elements in the universe combined in such a way as to yield living cells. These living cells evolved through mutation, adaptation and reproductive fitness into ever more complex biological structures until self-aware and intelligent life arose and eventually became us. The crowning achievement of chance. Under the materialist scenario, I think humans are a species without purpose and therefore without meaning beyond the existential meaning that each of us can wring for ourselves from our brief existence. As individuals and as groups, we weave narrative stories that give our lives meaning but only within the context of the narrative. These narratives are, after all is said and done, just stories. We are a species in a habitat subject to extinction at any time by a cosmic roll of the dice. Without belaboring the point, I suggest that you consider recent examples of some past events that without much ramping up could, under today’s conditions, have a civilization-ending impact, if not extinguish the human species. As relatively recent examples, consider super volcanic explosions such as Krakatoa in 1883, coronal magnetic ejections from the sun like the Carrington event of 1859 or incoming space debris such as the Tunguska explosion of an asteroid over Siberia in 1908. If you’re unfamiliar with these, look them up and then consider their potential impact on modern technological society. A catastrophic result would be even more likely should the event be much larger like some that have occurred farther back in the past. Then there is always the possibility that we’ll follow one of our narratives into a blind alley and destroy ourselves. We have many options for self-destruction among which we can also count the effects of nuclear weapons, weaponized biology and environmental overload and collapse. Of course, even should we survive all rolls of the dice and suicidal behavior, science predicts that the universe will eventually end. The nature of its termination is not certain but it could expand until it exhausts itself, grows cold and dies with a whimper, or it might contract, implode and die with a bang. The second ontology and counterpoint to scientific materialism is what I have written about as panentheism and others as monistic idealism. One contemporary proponent of this world view is Bernardo Kastrup, whose several books (amazon.com) and papers (academia.edu) I recommend to you. He has a short video summarizing monistic idealism (see links page). If one looks at the the two ontologies as pyramids, they look very similar but hold radically different implications. Before describing the pyramids, recognize that all ontologies make assumptions. If there is only one base assumption, it is termed an ontological primitive. Such a base assumption is necessary because you can’t go on indefinitely explaining one thing in terms of another (e.g, where does X come from?, from X1, where does X1 come from?, from X2, where does X2 come from?, from X3 and so on ad infinitum). The “buck” has to stop somewhere and that is at the ontological primitive or base assumption. The materialist pyramid begins at the base with the assumption of space/time, which reminds me of Einstein’s remark, “Time and space are modes by which we think and not conditions in which we live.” Moving up the pyramid toward the apex, we come to energy & matter, then atoms & molecules, then chemistry, then biology and finally mind. The pyramid for idealism is almost identical except that it begins at the base with the assumption of awareness or consciousness and then moving toward the apex comes space/time and so on. Everything moving up the pyramid is derivative of the base assumption nx times removed. Briefly, the big shift with this change in base assumptions is that now instead of thinking of reality as something “out there” it is something “in here.” That is, what you take to be an external reality actually is a manifestation in consciousness, and you likewise are a manifestation in consciousness. By way of analogy, think of reality under idealism like a virtual reality, computer game. If you don’t have any experience with these games, it may not be a good analogy for you. If you want to explore this analogy further, one source you might look into is the book My Big T.O.E. (theory of everything) by Tom Campbell. An analogy that has been used for millennia is that of a dream with which you probably do have some experience. However, whether you are in a dream or a virtual reality game, everything would seem real to you. The game runs under a set of rules and if the rules won’t allow you to walk through walls, you will be deflected by a wall should you walk into one. It would seem like a “real” wall but it is actually just an illusion created in a “computing” space by a computer. Essentially, the same applies to a dream, except it is being created in your consciousness by mind. In fact, some have suggested that one function of dreaming is to remind us that consciousness can generate “realities” and thereby serves as a hint for recognition of the actual nature of our perceived reality. Under the idealism scenario, there is meaning and purpose, which for brevity’s sake I’ll just say is Awareness’ way of generating experience for itself and the opportunity to evolve. Put another way, we and our world are illusions within a field of intelligent and creative Awareness or Consciousness exploring itself. Thus, the illusion, like a virtual reality game, once set in motion plays itself out according to the defining ruleset governing it. Should, for example, the evolution of the universe, under the rule set, happen to cross our orbital path with a large asteroid or we engage in a nuclear war and life on this planet is extinguished or even if the entire planet is destroyed, it doesn’t really matter in any fundamental sense because Awareness or Consciousness goes on and you are a thread within it. It is like failing the fifth grade — embarrassing but not fatal. There will be a new game or dream on a new planet, perhaps even in a different universe. nentially, growth slowing in food, services, and material wealth per capita). The simulation of this scenario results in ‘‘overshoot and collapse’’ of the global system about mid-way through the 21st century due to a combination of diminishing resources and increasing ecological damage due to pollution. “The comprehensive technology approach attempts to solve sustainability issues with a broad range of purely technological solutions. This scenario incorporates levels of resources that are effectively unlimited, 75% of materials are recycled, pollution generation is reduced to 25% of its 1970 value, agricultural land yields are doubled, and birth control is available world-wide. These efforts delay the collapse of the global system to the latter part of the 21st century, when the growth in economic activity has outstripped the gains in efficiency and pollution control. Turner, G. M. (2008). “A comparison of The Limits to Growth with 30 years of reality.” Global Environmental Change 18(3): 397-411.